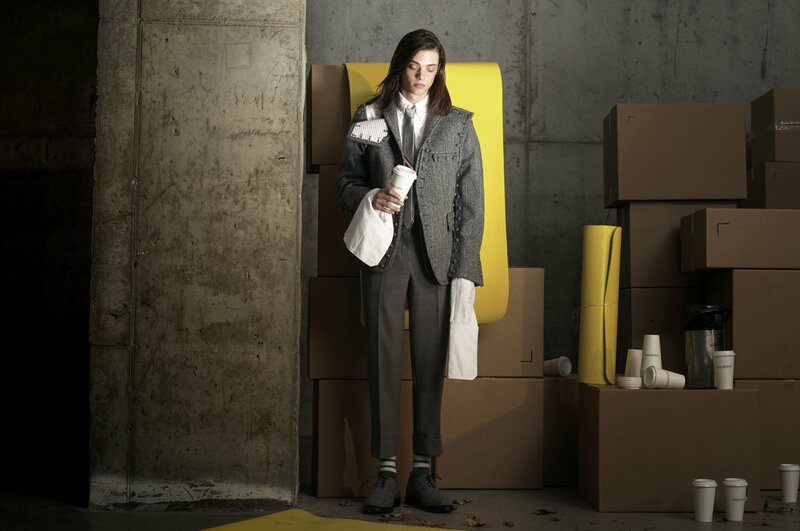 Charlap Hyman & Herrero designed the set for SSENSE's photo shoot, Thom Browne's Corporate Playground: Pursuing Work/Life Balance with Thom Browne Fall/Winter 2017. Yoga mats, nap-pods, and a slide in the lobby – alongside mirrored whiteboards, conference tables balanced on exercise balls, and stacks of cardboard boxes – conjure up the hybrid nature of the start-up workplace. Caught between health-crazed and consumerist trends on the one hand and the archetypal office environment on the other, CHH’s corporate campus is a strange mélange of juvenile and adult, functional and leisurely, fantastical and banal. Jason Nocito has photographed models playing and lounging around the set, styled by Avena Gallagher, in business attire by Thom Browne. CHH’s set, in shambles itself, has a hand in the photo shoot's mockery of the one-size-fits-all trend of today's workplace environments.